Answer: Yes, wherever you are, “up” is the direction straight overhead. But that’s if you’re looking at it from your local frame of reference. I’m certain what the narrator was talking about was the direction of “up” with respect to the Earth frame of reference. In that case, “up” means the direction away from the center of the planet. I couldn’t do an Earth graphic showing both England and Australia, since they’re on opposite sides of the planet, so I did one showing North America and Africa. It will work for answering your question. 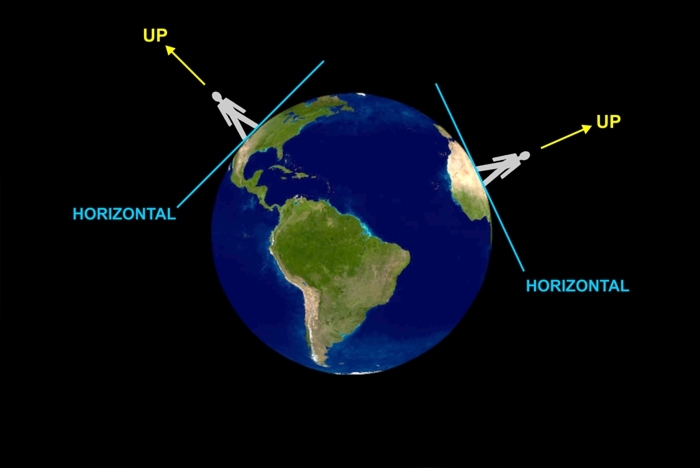 The direction we call “horizontal” would be a plane tangent to the surface of the Earth at the observer’s location. The direction we call “up” would be perpendicular to that horizontal. Take a look at the graphic above, and you’ll see what I mean. It’s a little disorienting when you realize people on the other side of the planet are “upside down” compared to you, but it’s a perfectly normal consequence of how gravity behaves. Gravity pulls everything toward the center of the planet, something Sir Isaac Newton demonstrated back in the 17th century. And that applies to everything from apples to the Moon itself. Over small horizontal distances, you don’t really sense this change in direction. But over larger distances it becomes quite apparent. For example, the two towers of the Golden Gate Bridge in San Francisco were engineered to be exactly vertical for stability. But the tops of those 230 meter towers, separated by nearly 1.3 km, are about 5 cm (2 inches) farther apart than their bases. This is just one of the consequences of living on a round planet. You can read about some of the other interesting consequences here. The change in the direction of “up” is easily quantified. Earth’s circumference is 40,000 km, and since one circuit around that circumference equals 360°, the tilt works out to 360°/40,000 km = 0.01°/km (0.015°/mile). By the time you get halfway around the planet, that tilt works out to 180°, which is upside down compared to your starting point. You can just barely see the effect of Earth curvature when looking at distant skyscrapers. 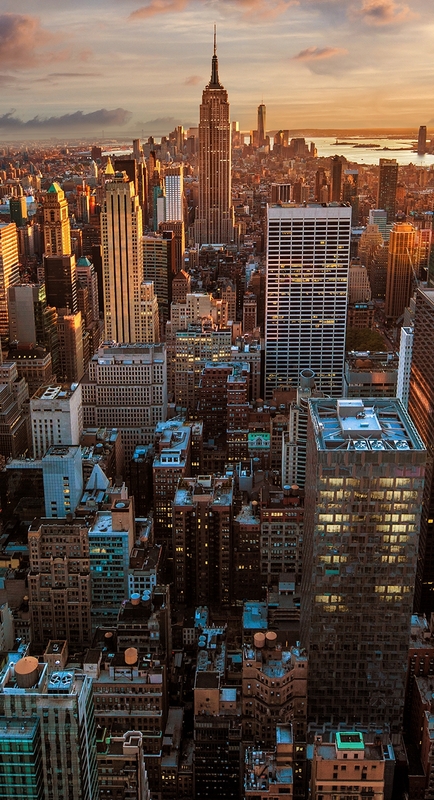 Even though each one is vertical at its own location, distant buildings will be seen as slightly tilted away. You’ll need a telescope to see this, and a day with very clear air (rare anyplace you find skyscrapers). But I’ve seen it when viewing Phoenix from my home, 50 km north of center city. At that distance, the tilt is about 0.5°. My telescope was operating near 300x, and it was the day after a rain, so the air was about as clear as it gets. I focused on the most distant skyscraper I could find (there are some mountains in the way). To my eye, I seemed to be “looking up” at an object I knew was below me. I’m willing to admit that what I perceived as “tilt” may have come more from my brain than my eye. The eye-brain system can do some interesting things, as I’ve written about in other posts. 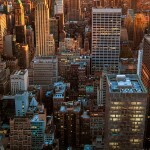 The thumbnail below is a view over the 20 km length of Manhattan Island. Over that length, the direction of “up” changes by only 0.2°, so it’s not as easy to see. But take a look at those distant structures on the far end of the island, and consider how they are leaning away by an angle that would topple them on a “flat earth.” Click to enlarge.